The 127th issue of the bestselling ongoing series THE WALKING DEAD sold out instantly at the distributor level and will be immediately rushed to a second printing to meet customer demand. Despite being the bestselling franchise in the industry according to Diamond Distributors, a fixture of the New York Times bestseller list for numerous consecutive weeks, and having a hit cable television show on AMC of the same name, the series remains under-ordered within the direct market a stunning 10 years and 127 issues after its debut. THE WALKING DEAD #127 has completely sold out at the distributor level, but may still be available in comic stores. The digital version is currently available DRM-free on the Image Comics website (imagecomics.com), plus it can be downloaded from Comixology on the web (comixology.com), Apple iOS, Android, and Google Play. Image Comics is sending this 127th issue back to print to meet customer demand, but it will not be reprinted again. 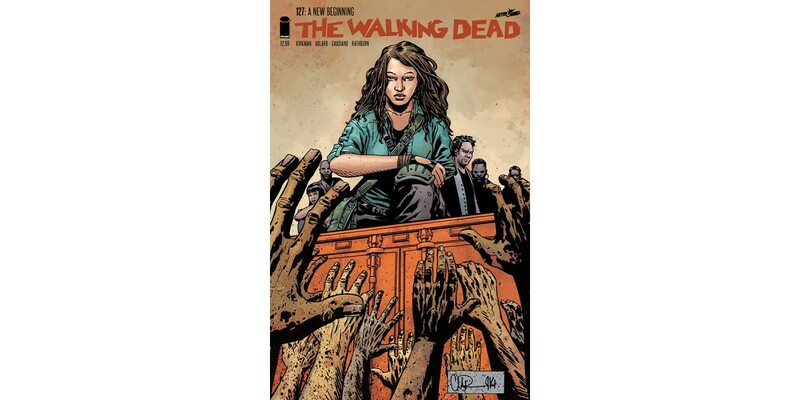 The second printing of THE WALKING DEAD #127 (Diamond Code APR148156) will release on 6/11. THE WALKING DEAD #128 will release on 6/11 and can be pre-ordered with Diamond Code APR140615. This will be the only printing of this issue.